April 11, 2018, 9:06 a.m.
By Christine Schmidt @newsbyschmidt April 11, 2018, 9:06 a.m.
“So why do you think millennials can’t afford houses?” wonders a man with a white handlebar mustache. “Because avocado toast is priced up to $17!” a man gestures back emphatically. “Millennials aren’t able to afford homes because of an overall housing crisis and rising student debts, not because of the price of avocado toast itself,” the mustachioed man shoots back. “Avocado toast is delicious and innocent!” A chair is thrown. “The whole point of @TheAvocadoDream is proving that houses actually cost more than just a couple servings of smashed avo toast,” the mustachioed man — the star of “American Chopper,” a reality TV show about a father-son motorcycle customization setup, now featured in a viral meme of one interaction from an episode — indignantly declares, pointing his finger. Or at least that’s how Margaret Lin envisioned the meme for Curbed’s first side account on Instagram, The Avocado Dream. Drawing on Internet mischief and real-life home listings, the account is a satirical compilation of quirky real estate listings and their listing price in the currency of avocado toast at local hipster spots. For Curbed, Vox Media’s home and real estate site, it’s a big part of social media strategy. “The account fits squarely into our editorial strategy. We’re constantly tapping into the cultural zeitgeist, often including social media, to report on trends,” Curbed executive editor Mercedes Kraus, who was engagement editor at the time of the side account’s launch, wrote in an email. (She pointed to Curbed’s reporting on conversation pits and the succulent craze as examples of Curbed’s trendiness, and Curbed writers’ highly followed personal accounts as further evidence of their Instagram savviness.) “We don’t, though, often have occasion to embrace memes and meme culture. 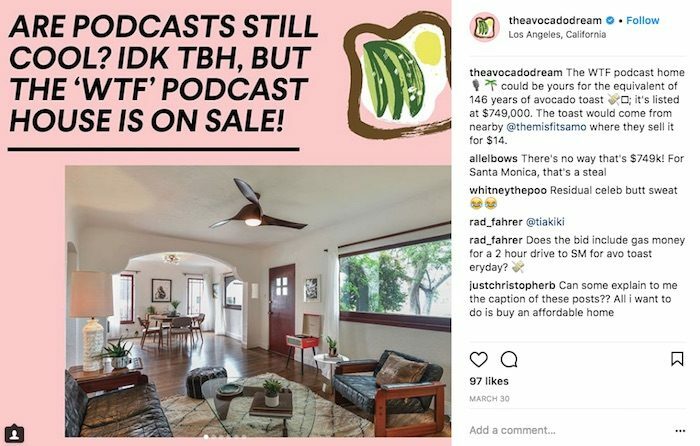 “When [Lin] — the Curbed staff’s most meme-articulate editor — pitched the idea for The Avocado Dream account, the promise was immediately obvious: The millennial-blaming meme could wryly communicate the difficult economic reality around the national affordable housing crisis, a regular topic for Curbed. We wrangled the concept and doubled down on graphic design trends that target millennials — including their eponymous pink, rounded fonts, and spacious underlining, and thick image borders — the kind of look you’d see on ads for Thinx or Outdoor Voices,” Kraus added. Curbed’s house Instagram account has 73,000 followers, but Lin and other members of the team saw an opportunity to nurture a new following. In a few weeks post-soft launch, The Avocado Dream — whose bio is “for millennials who love homes but can’t afford them” — has about 3,000 followers. So how do you calculate the price of avocado toast? And what makes a piece of real estate Avocado Dream-worthy? Curbed’s food-focused sister site, Eater, shared the math behind the cost of the smushy fruit + bread, but Lin looks to menus at restaurants near the listing for market-specific prices and plugs them into her formula. To find listings to showcase, Lin said she scours Curbed’s 14 city sites to find unique homes under $1 million — “otherwise it gets to be 300,000 years of avocado toasts, and that gets ridiculous and out of control” — with elements that can be satirized or are accessible to everyday humans. Then she looks at Eater or Yelp for local restaurants with avocado toast and adds that to the posting as well. This smol and green cottage could be yours for the equivalent of 192 years of avocado toast 陋; it’s listed at $895,000. The toast would come from nearby @pronaturalfoods where they sell it for $12.75. But what is The Avocado Dream’s expected shelf-life? What if the avocado toast meme doesn’t go on forever? POSTED April 11, 2018, 9:06 a.m.
Schmidt, Christine. "How many avocados for a houseboat? Curbed’s spunky side Instagram mixes memes with real estate coverage." Nieman Journalism Lab. Nieman Foundation for Journalism at Harvard, 11 Apr. 2018. Web. 24 Apr. 2019. Schmidt, Christine. "How many avocados for a houseboat? Curbed’s spunky side Instagram mixes memes with real estate coverage." Nieman Journalism Lab. Last modified April 11, 2018. Accessed April 24, 2019. https://www.niemanlab.org/2018/04/how-many-avocados-for-a-houseboat-curbeds-spunky-side-instagram-mixes-memes-with-real-estate-coverage/.